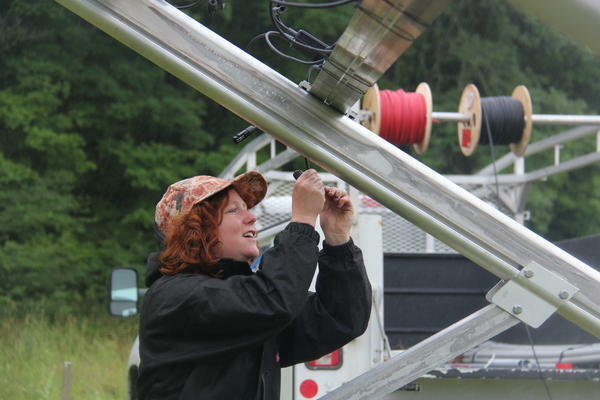 Catamount Solar is installing an 8.7 kilowatt system in a homeowner's yard in East Montpelier. Kestrel Marcel of Catamount Solar is connecting the optimizers, which are a converter technology that helps maximize the energy harvested from the panels. After years of encouraging solar development, Vermont seems to be attracting the attention of national solar companies. Historically, most Vermont solar projects have been installed by homegrown businesses, but in recent years at least three big companies have started offering residential solar installations in the Green Mountain State. The Utah-based company Vivint Solar recently announced it will be offering residential installations in Vermont. CEO David Bywater says his company was attracted to Vermont’s green policies. "It's always nice to have allies pushing for the green agenda, and helping the population adopt solar. So I'm actually embarrassed that we weren't there earlier," says Bywater. The company already has a presence in the region: Vivint Solar is the second-largest residential solar installer in Massachusetts, and does business in Connecticut and New York. It recently expanded into Rhode Island and New Hampshire, and now Vermont. Vermont isn't a populous state, with just over 600,000 people living here, and it already has 40 solar installation companies working here. So at a glance, it may seem strange that national solar companies are coming here. But it may simply be that the state’s policies to encourage solar development are working. "In 2015, Vermont was, for cumulative solar capacity per capita, was seventh in the country," says Sean Gallagher, the vice president of state affairs at the Solar Energy Industries Association. He says the residential solar market has been taking off nationally in the last few years. Gallagher says it's being driven by a combination factors. For one, solar costs have gone down 65 percent in the last five years. And he cites new financing options like leasing, which have helped more people access solar. "And the third thing is good state policies," says Gallagher. "Vermont has good statewide net metering policy — that's been an important driver." Net metering rules govern how much credit homes and businesses can bring in for selling their excess solar energy back onto the grid. Vermont recently rewrote its net metering rules. The new policy prioritizes putting solar projects on landfills or brownfields (see page 9 for complete list). That means some projects — like building solar in a farm field — will no longer be economically viable. But for homeowners, the economic incentives remain fairly high. Plus, Vermont recently set a lofty goal of having 90 percent of its energy be from renewable sources by 2050. "When it comes to renewables, Vermont may be a small state, but it's punching above its weight," says Gallagher. Beyond Vivint Solar, other national solar companies are taking notice, too. Earlier this year, San Francisco-based Sun Run expanded into Vermont. And in 2015, California-based SolarCity started offering residential solar installations in the state. "I think it's great that other companies are looking to help Vermonters go solar," says James Moore, a co-founder of Vermont-based SunCommon. "We welcomed SolarCity when they came into the market. We welcome these other national players. The reality is that we've seen most Vermonters pick a Vermont company to go solar with." That has been true. But the competition is real. On a recent drizzly morning, installers with Catamount Solar are setting up a series of panels in the field behind a home in East Montpelier. 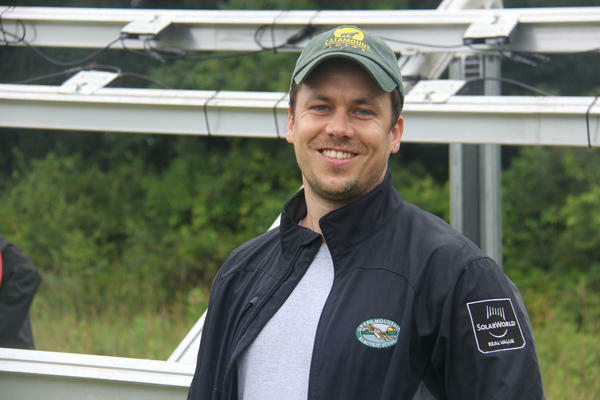 "This is a fixed array, so that the azimuth is predetermined, and we interconnect at the house there," says Andrew Wible, a co-owner of Catamount Solar, based in Randolph, Vermont. Wible says in some ways larger companies coming into Vermont drives the market for all solar. For example, national companies often have a larger budget for advertising, which helps raise awareness about solar in general, and sometimes sends customers their way. "When [national companies] come in, it sort of identifies that we're a local company and we live here, want to take care of our community," says Wible. "And I think that differential is good for us. The competition drives our market." Wible says with Vermont's new net metering rules, many of the commercial projects they used to work on — like putting panels in less productive farm fields and building community solar projects — are no longer economically viable. So now the company may rely more on the residential market to drive business. And that's where the national companies coming to Vermont, like Vivint Solar and SolarCity, are focusing their efforts, too. Wible says another distinction with Catamount Solar is it's focused on building a sustainable local economy — and that will appeal to some Vermonters. "Because we're going to be here," says Wible. "And I doubt that a lot of them [national solar companies] will be in the future. They'll ride that wave, they'll make their profit and they'll drive away." There's no knowing if that prediction will come true. But whatever happens, the competition in Vermont is increasing and the solar market is volatile. "They call the ride that we're on the solar coaster. And they call it that for a reason," says Moore. He says that one way SunCommon is trying to stay afloat despite the constantly changing state policies is by expanding into neighboring states. Vermont’s new net metering rules "stopped our ability to effectively do community solar here in Vermont, so we've looked across the lake and are doing community solar over in New York," says Moore. He says SunCommon is also shifting its focus to rooftop commercial solar and solar panels that serve as parking lot canopies. These are both areas that get top billing in Vermont's new net metering rules. Vermont companies SunCommon and Catamount Solar both say knowing the local terrain and the ins and outs of Vermont's rules will help them stay competitive in an increasingly tight market. But one looming storm on the horizon that would affect solar companies large and small is the possibility of a tariff being imposed on solar panels coming in from overseas. The U.S. International Trade Commission is hearing a case filed by a bankrupt American solar panel manufacturer arguing its domestic production has been harmed by the large inflow of panels produced overseas. The Trade Commission will issue its recommendation in September, and then it's up to the Trump administration to decide which aspects the U.S. will implement. U.S. solar companies say a tariff could be devastating: It would massively drive up the price of solar panels and stall this growing industry. Disclosure: Catamount Solar is an underwriter of VPR. This report comes from the New England News Collaborative. Eight public media companies coming together to tell the story of a changing region, with support from the Corporation for Public Broadcasting.